WHERE IS THE UBER PROJECT? - Marco Beverage Systems Ltd. I have been meaning to outline the Uber Project’s plans for 2010. I feel compelled to get it done before February descends upon us all and leaves us mired in 2010 proper. This post will hopefully answer a few frequently posed queries and force me to set out some deliverables for the project this year. I apologise if this bit is somewhat salesy, but people are continuously asking me if the Uber Boiler is available, despite the post about the official launch last October. It is typically on a 4-6 week lead time – more on prices/discount structures etc. from sales@marco.ie. WHAT IS THE DIFFERENCE BETWEEN AN UBER BARISTA AND AN UBER CUPPER? Both are aesthetically identical. The original Uber Boiler as presented had an operational capacity of 1.5-2.0 litres, as it was originally intended for a brew-and-serve cycle in a cafe environment. It became clear quite quickly that the Uber Boiler had great potential as a cupping tool but the 2.0 litres capacity was limiting. We decided to produce an Uber Cupper with a 6.0 litre capacity to meet cuppers’ needs. 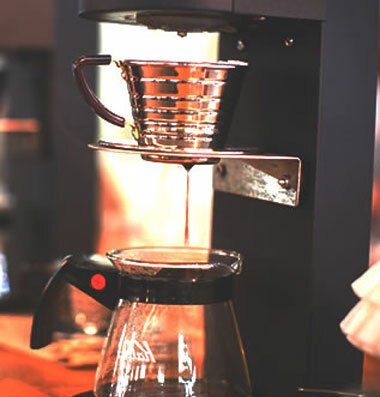 We have since realised the 6.0 litre unit is suitably compact to be used as a brew-and-serve unit for cafes with the added bonus of increased temperature stability the larger volume yields when refilling in a cafe environment. WHAT DOES ONE NEED TO INSTALL AN UBER BOILER? Specification – 220-240V and plumbed in mains water supply with either plumbed drain or bucket. We will continue the design evolution to improve the user experience, which we expect to unveil at the WBC in London in June. If there is stuff you’d like included, e-mail uber@marco.ie or post a comment here. WHAT ABOUT THE UBER GRINDER? The Uber Grinder is available also with burrs cut specifically by Ditting, further to this post. Ditting have cone some amazing research to come to the burr spec. When they clear what I can make public, I’ll post about it – it’s pretty good stuff. Lead time at the moment is 6-8 weeks. In 2010, we are looking for Uber partners to join the Uber Project. Partners will hopefully input to the future product evolution and in turn sell and support the Uber Boiler, Uber Grinder and come what may in different territories around the world. Contact uber@Marco.ie. WHERE WILL UBER APPEAR IN 2010? Greece – Horeca Expo – already finished! Hope January didn’t hurt too much. Happy rest of 2010 to all.